Wye Valley NOW launched in 2011 and has established itself as the best free county magazine in Herefordshire, Monmouth and Ludlow. Over 15,500 copies are printed each month and hand delivered through the letterboxes of middle-class homes in Hereford, Kington, Leominster, Ludlow, Bromyard, Malvern, Ledbury, Ross on Wye and Monmouth. 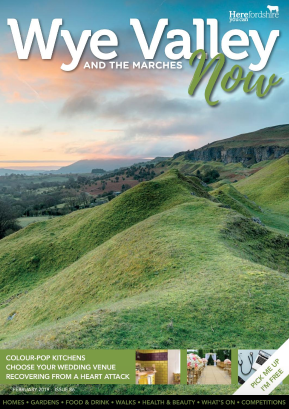 Wye Valley NOW is also delivered to various village stores, hotels, pubs, restaurants, garden centres, council offices, public facing attractions, libraries and train stations across the county. With our popular competitions and regular features such as: Homes & Gardens, Eating Out, Health & Beauty, Walks, Senior Living, What's On & Theatres there is something to read for ALL the family! Appealing to the more affluent reader, each of the NOW Magazines provides relevant, local editorial which ensure the magazines are both informative and well read. Priding themselves on direct distribution, each of the NOW Magazines are market leaders and a trusted brand for our commercial partners. As a targeted medium, our readers respond enthusiastically to a good business idea, which is why we are confident that those who advertise with us will have the opportunity to maximise their chances of success. Please send your artwork to paul@pw-media.co.uk or, in the case of larger files, via www.wetransfer.com using the same email address. We can also help create your adverts, just supply us with high resolution images, logos and content and we will work with you to create your own bespoke advert.